Masterworks Broadway Proudly Announces the Release of the New Broadway Cast Recording of Michael Stewart and Jerry Herman's Musical Theater Masterpiece Bette Midler in HELLO, DOLLY! 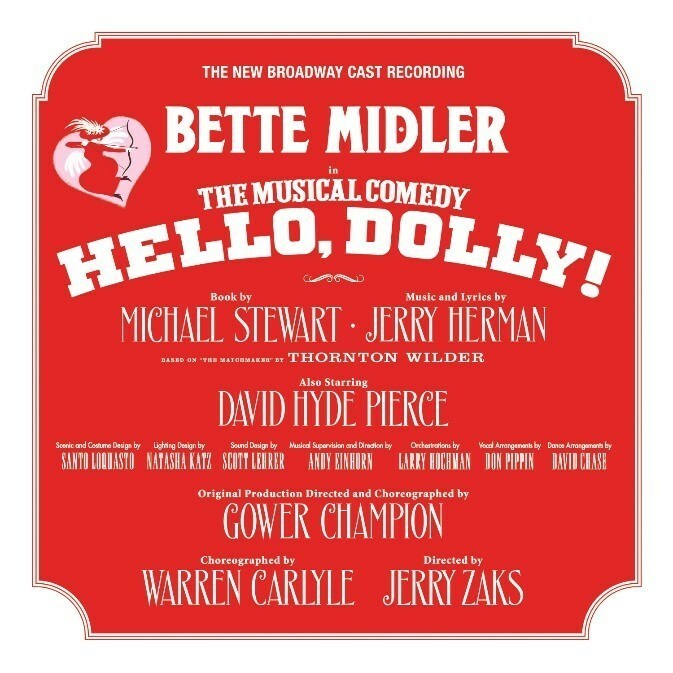 Masterworks Broadway proudly announces the release of The New Broadway Cast Recording of "Hello, Dolly!" starring three-time Grammy Award-winning legend Bette Midler as Dolly Gallagher Levi. Produced by multiple-Grammy Award® winner Steven Epstein, with a cast of 37 and 28 musicians, the album will be released May 12 and is available for preorder now. The Broadway revival of Michael Stewart and Jerry Herman's masterpiece "Hello, Dolly!" is directed by four-time Tony Award® winner Jerry Zaks and choreographed by Tony Award winner Warren Carlyle, "Hello, Dolly!" is now in previews at Broadway's Shubert Theatre, with an official opening night of April 20. "Hello, Dolly!" instantly became the hottest ticket of the year when it broke the record for best first day of ticket sales in Broadway history. By the time it began previews, it had the largest pre-performance advance sale in Broadway history. Recently, the production shattered the record for the highest weekly gross of any show in the history of the Sam S. Shubert Theatre – a record set by a previous tenant over a nine-performance week -- in just seven performances. This "Hello, Dolly!" is the first new production of this classic musical (based on Thornton Wilder's The Matchmaker) to appear on Broadway since it opened more than fifty years ago. It pays tribute to the original work of legendary director/choreographer Gower Champion, which has been hailed both then and now as one of the greatest stagings in musical theater history. Bette Midler is joined by Tony Award® and four-time Emmy Award® winner David Hyde Pierce (Horace Vandergelder) two-time Tony Award® nominee Gavin Creel (Cornelius Hackl), Tony Award® nominee Kate Baldwin (Irene Molloy), Taylor Trensch (Barnaby Tucker), Beanie Feldstein (Minnie Fay), Will Burton (Ambrose Kemper), Melanie Moore (Ermengarde), Tony Award® nominee Jennifer Simard (Ernestina), and an ensemble of twenty-eight. The complete creative/design team for the production features three-time Tony Award® winner Santo Loquasto(Scenic & Costume Design), five-time Tony Award® winner Natasha Katz (Lighting Design), Tony Award® winner Scott Lehrer (Sound Design), Andy Einhorn (Music Direction), Tony Award® winner Larry Hochman(Orchestrations), Tony Award® winner Don Pippin (Vocal Arrangements), David Chase (Dance Arrangements), and Telsey + Company (Casting). The ensemble features Cameron Adams, Phillip Attmore, Giuseppe Bausilio, Justin Bowen, Taeler Cyrus, Elizabeth Earley, Leslie Donna Flesner, Jenifer Foote, Jessica Lee Goldyn, Stephen Hanna, Michael Hartung, Robert Hartwell, Aaron Kaburick, Amanda LaMotte, Analisa Leaming, Jess LeProtto, Ian Liberto, Kevin Ligon, Nathan Madden, Michael McCormick, Linda Mugleston, Hayley Podschun, Jessica Sheridan, Michaeljon Slinger, Christian Dante White, Branch Woodman, Ryan Worsing, and Richard Riaz Yoder. Masterworks Broadway is a label of Sony Music Masterworks. For email updates and information on Masterworks Broadway please visit masterworksbroadway.com.